You already know how many shopping days are left before Christmas, but keep reading to find out where to find the mostest soul-satisfying LIVE music right through the whole blinkin’ Holiday season. Yuletide is Blues time, at The KnuckleDown Saloon. Come out, and hear The Birddog Blues Band with Mel Ford on guitar, Ken Olufs on harmonica, Tom McCarty on bass, and Derek Hendrickson on drums. 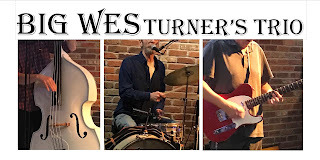 Tyranena Brewing taps Wisconsin’s best beers, and Big Wes Turner’s Trio (Rick Becker on drums, Gary Hendrickson on guitar, Tom McCarty on bass) sings and swings Blues and rocks & rolls Rhythms for discerning groove aficionados. An easy drive to nearby Lake Mills. 7 to 10. The Sparks Band, (Rich Larson on drums, Mark Loder on guitar, Tom McCarty on bass) those administrators of 60s nostalgia, rock out early at Chief’s. 6:30 to 10. Again, with The Sparks Band, this time at The Hody Bar & Grill in Middleton. 9 to 1. Ring in the new year with the authentic Chicago Blues sounds of The Cashbox Kings at The Knuckle Down Saloon. Music starts this year, ends next. And what will 2019 bring? Besides some well-deserved hibernation? Tom joins forces Jimmy Voegli and Perry Weber (of The Jimmys) for an evening of Blues with drummer Tony Wagner, host of Wednesday’s With Wags at The Wheelhouse in Waupaca. Check back here for more breaking McMusical news. Thus this late addition to the McMuscial calendar. We’re talkin’ this Friday, folks! Dress for the weather and hoist a few with the Wes ones at venerable far westside hang, The Club Tavern (home of the one and only Mooseburger). When the chips are down, who ya gonna call? Big Wes Turner’s Trio! 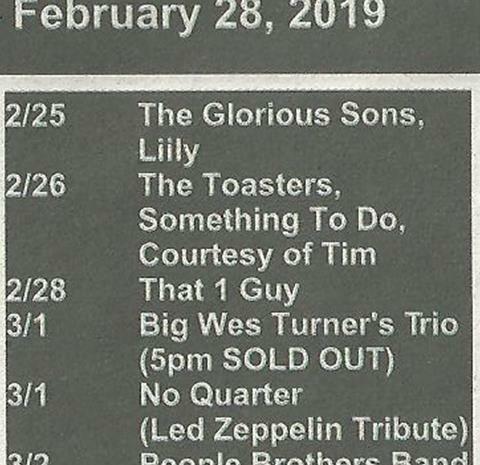 Thus the late addition to The Club Tavern line-up, but a perfect night for Blues, Rhythm & Blues, Rock & Roll (and even a few Country & Western classics). 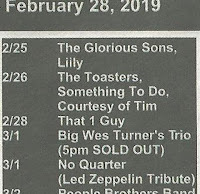 The “biggest little band in Mad-land” puts all six hands to many musical tasks at this venerable west side venue. 9 to 1. Hey Kids! The Cashbox Kings play kid-friendly Blues (seriously) before and after lunchtime at The Overture Center. Bring the family. Feed the wild blues musicians in their unnatural habitat. Tom goes bowling for The Blues (Society). Yes, the Madison Blues Society sponsors this fun event. Bowl away with the Packer game onscreen and groove to the Madtown Mannish Boys after the game. Wintersong! Faux Fawn, brainchild of singer/songwriter Paul Otteson, joins a plethora of notable Madison performers to present original seasonal songs. Feel the spirit of the season, and help raise funds for Second Harvest foodbank. The Barrymore Theater, Atwood Avenue. Tyranena Brewing with The Cashbox Kings. ‘Nuff said. 7 to 10. Tyranena Brewing with Big Wes Turner’s Trio. Even more ‘Nuff said. 7 to 10. The Sparks Band, those masters of 60s nostalgia, rock out early at Chief’s. 6:30 to 10. The Sparks Band at The Hody Bar & Grill in Middleton. 9 to 1. Ring in the new year with The Cashbox Kings at The Knuckle Down Saloon. Music starts this year; ends next. Who knows what 2019 will bring? You will, if you just check back here for breaking McMusical news. To further paraphrase and plagiarize: Get up! Get up!! Get out of (wherever you are)!!! You won’t know if you don’t go. Just such efforts were rewarded last night when the only Little Vito (Stacatto) himself, AND two of the (original) Torpedoes, somewhat spontaneously assembled at Chief’s Tavern to take in some suds and the sounds of Big Wes Turner’s Trio. An unplanned but welcome mini-reunion. Not to mention the appearance of friends-of-Big-Wes Jim and Sarah, band photographers Jen and Rochelle, and random raucous revelers. But that was just the beginning. A quick nick over to the nearby Knuckle Down Saloon where The Bad Companions (featuring former members of Phil Gnarly & the Tough Guys) were jamming into the wee hours found not only the regular denizens of the venerable eastside Blues venue, but longstanding Madison songwriter of note Robert J, plus former Essen Haus BFF of Big Wes Mitch F., and next-door neighbor, Mark B. Big Wes Turner’s Trio (featuring fabulous fill-in guitarist, Billy Flynn) plays for party people at The Athens Grill (on Highway M, just down from Skipper Bud’s) for a tag team tap-takeover event featuring two amazing threes—we’re talkin’ ThreeSheeps Brewing Co. (of Sheboygan) and ThreeFloyds Brewing Co. (of Munster, IN). Taps open at 6pm. Music starts at 7:30. The Sparks Band heats up an Autumn evening on the shores of the Wisconsin River at TheVintage Brewery in Sauk City. Eat, drink, and rock out to 60s sounds. When in Wisconsin’s Little Switzerland (aka, New Glarus), where better to party hearty to swingin’ sounds than at Toffler’sBar & Grill. 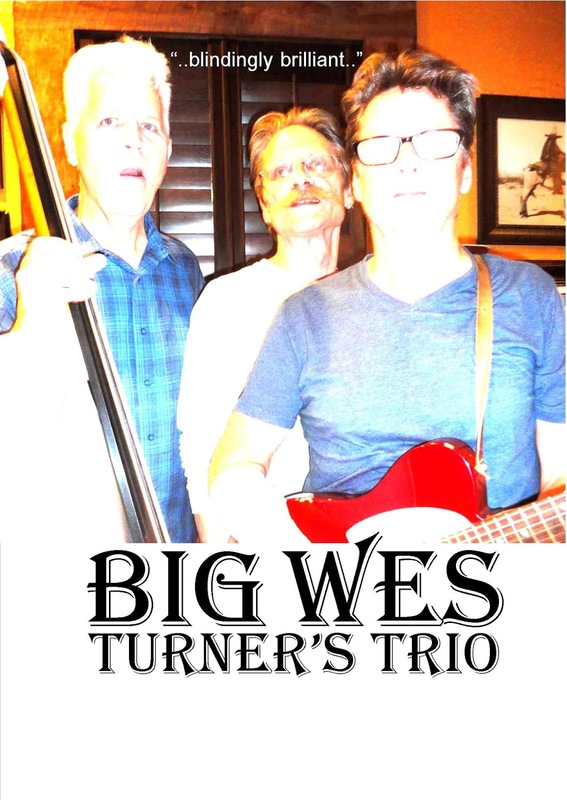 Enjoy their pre-Thanksgiving customer appreciation bash along with The Birddog Blues Band. Hey Kids! The Cashbox Kings plays kid-friendly Blues (seriously) before and after lunchtime at The Overture Center. Bring the family. Feed the wild blues musicians in their unnatural habitat. Check back soon for December dates in McMusical news.